Spray several small microwave-proof cups with cooking spray. Fill each cup no more than 1/2 full with batter. Microwave one cup at a time on high for 2 to 3 minutes (depending on microwave strength and amount of batter). Watch for doneness and do not over bake. Cool cupcakes. Frost and decorate as desired. This recipe is flexible. Make as few or as many cupcakes as you like. Refrigerate remaining batter and use within a couple of hours or bake traditionally in a smaller pan. 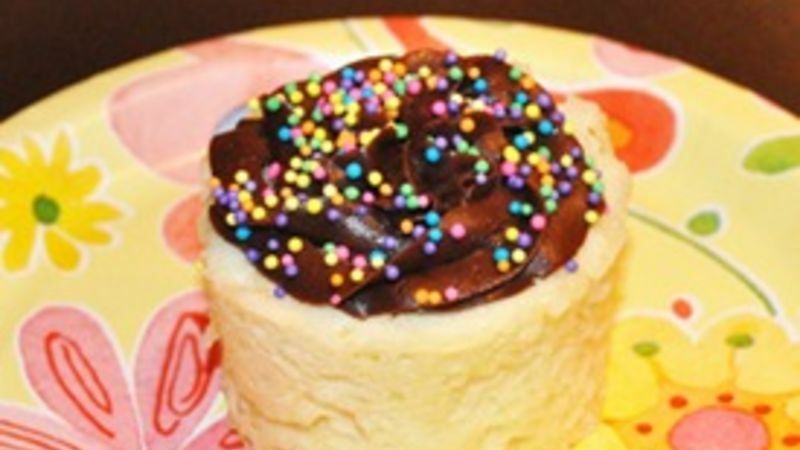 When you want just a little taste of something sweet, this microwave cupcake recipe is the perfect snack-sized dessert. While it starts the same way you’d prepare any boxed cake mix, it’s finished in the microwave for truly effortless baking. And it’s perfect for those unexpected dessert cravings, or when its too hot to turn on the oven. Plus, you can make as many or as few as you want. Just remember, all microwaves are different, so depending on your microwave oven, cooking times may vary. So keep an eye on your cupcakes to avoid over baking! For more traditional (and even untraditional) treats, check out our other delicious cupcake recipes.